Power Balance Ball (BOSU style ball) is an inflatable dome with an option to attach exercise power cords on the sides. The comfortable fun way to workout your entire body. Used properly the Power Balance Ball will help you to tone and sculpt your body while losing extra pounds. Its unique design is intriguing and allows for new ways to exercise your body! It helps strengthen and coordinate your body by targeting those core muscles around your abdominal and back area. You not only gain strength, but trim, and tone your entire body. Yoga and Pilates exercises can also be done using the Power Balance Ball. It comes fully assembled and just needs to be inflated. - Blue with black base. From the elite athlete to kids to weekend warriors trying to stay in shape, BOSU® Ball helps to strengthen and coordinate your body including the muscles that you don't see. BOSU® Ball targets the core muscles of your body—those muscles around your abdominal and back area—helping you to not only gain strength, trim, and tone, but to help coordinate your entire body. 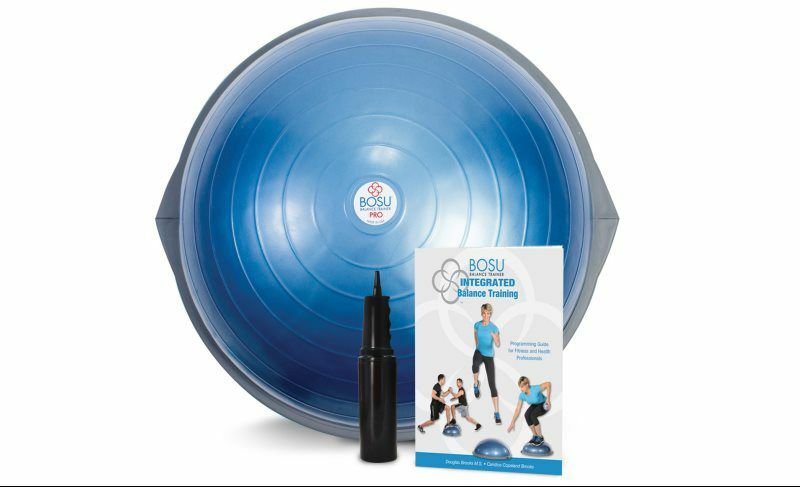 Your BOSU® Balance Trainer is available in blue only and comes with a workout video, a pump and exercise manual that will get you started exercising in the most exciting new way you've ever imagined! 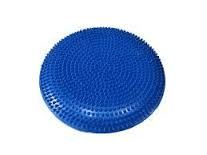 A Balance Cushion that will force you to balance while you sit; causing constant micro-movements that will strengthen your core, improve posture and boost circulation. The unique textured surface stimulates blood flow and its compact size allows for easy travel, so you can sit actively anywhere – at home, the office or even on an airplane! 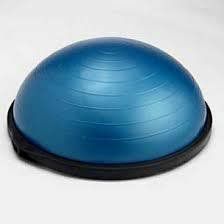 Featuring a new, improved design and durability, the BOSU® Balance Trainer has a bladder weight of 8 pounds, and a dually over-molded platform for extra strength. You do not have to be a world-class athlete to benefit from balance training. Benefits include coordination, muscle isolation, weight loss, and core stabilization. Balance training is ideal and recommended for people of every age. Making it perfect for studios, home gyms clubs, and rehab centres.